The video is compressed by MJPEG. There are VGA/QVGA/QQVGA three video resolutions optional. User can changes some parameters according to their demands to satisfy his own visual prefer. Manufacturer provides free software, support Multi-view, long time recording, video playback etc.. The video is compressed by MJPEG. There are VGA/QVGA/QQVGA three video resolutions optional. User can changes some parameters according to their demands to satisfy his own visual prefer. Infrared LED for night vision covers 5m area, to realize 24 hours monitoring Support 802.11b/g/n protocol, can build up wireless monitoring Support AP mode, the PC and mobile phone can be directly connected to the camera by WiFI, don’t need the router Support motion detection, send alarm information by email and FTP Support mobile phone to view Built in web server, all data is transferred through one port; it is easy for user to do the network setting Manufacture attached a label at the bottom of each IP Camera, it include DDNS. 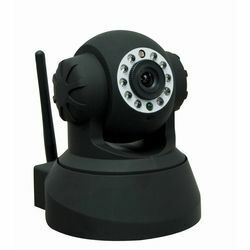 When IP Camera is connected to the internet, this URL can be used to visit the device The camera adopts 300K pixels CMOS sensor, 3.6mm lens, built in MIC, 12 pieces IR LED, audio out socket. It uses 5V power adaptor Manufacturer provides free software, support Multi-view, long time recording, video playback etc.. Automatically control through the photoresistor.